Gothenburg University and Högskolan i Borås, Sweden. Introduction. Activity theory, developed in the USSR as a Marxist alternative to Western psychology, has been applied widely in educational studies and increasingly in human-computer interaction research. Argument. The key elements of activity theory, Motivation, Goal, Activity, Tools, Object, Outcome, Rules, Community and Division of labour are all directly applicable to the conduct of information behaviour research. An activity-theoretical approach to information behaviour research would provide a sound basis for the elaboration of contextual issues, for the discovering of organizational and other contradictions that affect information behaviour. It may be used to aid the design and analysis of investigations. Elaboration. The basic ideas of activity theory are outlined and an attempt is made to harmonize different perspectives. A contrast is made between an activity system perspective and an activity process perspective and a diagrammatic representation of the process perspective is offered. Conclusion. Activity theory is not a predictive theory but a conceptual framework within which different theoretical perspectives may be employed. Typically, it is suggested that several methods of data collection should be employed and that the time frame for investigation should be long enough for the full range of contextual issues to emerge. Activity theory offers not only a useful conceptual framework, but also a coherent terminology to be shared by researchers, and a rapidly developing body of literature in associated disciplines. An alternative version of this paper, using TiddlyWiki, is now available. Activity theory, or 'cultural-historical activity theory' as it is also known, has its origins in the search in the Soviet Union for an alternative to the then existing basis for psychology in behaviourism and psychoanalysis. The development of cultural-historical activity theory is associated with the names of Lev Vygotsky (1896-1934), Sergei Leonidovich Rubinshtein (1889-1960), Alexander Luria (1902-1977) and Alexei Leont'ev (1904-1979). Leont'ev's contribution deserves further attention because virtually all of the key features of activity theory emerged in his work. It must be made clear, however, that all of these writers were working in the field of psychology and that their primary concern was in understanding the fundamental psychological basis of human behaviour through the study of language, learning, cognitive disabilities and other phenomena. Leont'ev, in particular, was concerned with the nature of consciousness, and sought an explanation that did not rely upon postulating the existence of unobservable mental phenomena. Leont'ev defines 'activity' as those processes 'that realise a person's actual life in the objective world by which he is surrounded, his social being in all the richness and variety of its forms' (Leont'ev 1977). Thus, society, or 'community' as it is expressed in later activity theory writing, is central to Leont'ev's concept of activity. Largely as a consequence of the significance of Vygotsky's work in developmental psychology and the theory of learning, activity theory first made its appearance in the West in the field of educational research. Here, Vygotsky's concept of the Zone of Proximal Development gained attention, partly by the re-presentation of Russian work and subsequently through independent work, (e.g., Rogoff & Wertsch 1984 ; Exner 1990; Salomon et al. 1989). Education was also the initial field of research of Yrjö Engeström, who is probably the best known of the Western interpreters of activity theory. Engeström's early work was almost entirely in Finnish and concerned to a large degree with ideas on the reform of educational practice, but he has moved from education in the narrow sense to the study of learning in work situations (Engeström 1994, 2000, 2001) and in the application of technology (Mwanza & Engeström 2005). This move has been accompanied by more publication in English. More recently (and partly through the influence of Engeström's work), activity theory has found a place in human-computer interaction and information systems research. (Bødker 1989; Kuutti 1991; Kaptelinin 1994; Nardi 1996a; Kaptelinin et al. 1999; Ditsa 2003). Here, the dominant model of activity theory has been Engeström's, but an alternative representation of the theory (known as systemic-structural activity theory), by Bedny (2000), has also gained support. Bedny's conception of activity theory is derived from the work of successors to Vygotsky, and, in particular, from the work of Rubinshtein (e.g., 1957). Before his move to the USA, Bedny was at Kharkov University, an institution at which both Luria and Leont'ev had worked and he may be considered to be in the direct intellectual line of these founders of activity theory. Importantly, from the perspective of information behaviour research, he also points to the need, if an activity-theoretical perspective is adopted, of having a time-frame for research that is long enough to understand information users' behaviour and their motivations. Clearly, both of these points are of significance for the study of information seeking behaviour and Hjørland, since 1997, has published a number of papers in which he indicates the value of activity theory in underpinning his own philosophical position of 'critical realism' and his theoretical framework of 'domain analysis' (e.g., Hjørland & Albrechtsen 1999; Hjørland 2000, 2004). Mention has been made already of the different tendencies in activity theory, with one school of thought stemming from Engeström's research activities and another from Bedny's 'systemic-structural activity theory'. The two are very closely related, but authors from one or the other group use different diagrams to illustrate the components of the theory. The most basic representation and perhaps the closest to the ideas of the founders is Bedny's (Figure 1 below). It should be noted that 'tools' may be artefacts or abstract constructs: thus, in working with a computer we use a mouse, an artefact but, in using a computer to perform organizational tasks we may follow certain rules that, for example, forbid personal use of the e-mail system. The rules are abstract constructs that govern the particular activity of computer use. The identification of two 'subjects' in the diagram signifies that activity may be shared or collaborative; that two or more persons may work together to achieve some predetermined goal. This fact introduces the notion of the division of labour in the performance of activity. Some of these ideas are made more explicit in Engeström's formulation of activity theory and his diagram is widely used in the literature (Figure 2). The differences between Bedny's representation and that of Engeström are readily apparent: the triangle remains the dominant figure, but only one subject is represented and the notion of 'division of labour' is separately represented. Also, the concept of 'community' is introduced as part of the cultural context within which activity is performed and the abstract tool, 'rules', is also separated from artefacts that are here represented as 'instruments'. Thus, activity theory presents us with a framework for the analysis of activity in the socio-cultural-historical context of the community concerned and with regard to the motivations that give rise to goals, the accomplishment of which is the aim of activity. The framework identifies the tools - artefacts and mental constructs - that assist activity, as well as the rules, norms and division of labour that may affect activity. Given the complexity of human activity, we might expect inner contradictions to arise in the performance of activity as well contradictions brought about by the diversity of actors and their expectations. These distinctions are explored further, below. how the total activity system affects other activity systems in the organization: for example, providing a police officer with information at the point of need has implications for supervision, for the activities of the control room and for the provision of the underlying communications technologies. In this way a much deeper understanding is gained of the context of the information needs and information uses that are associated with the implementation of the new technology and the evaluation process can bring to the fore aspects of the organizational setting that affect the innovation but might otherwise be missed. The Social Services Department (community) is tasked with the care of children at risk in the wider community (local authority) and a social worker, as a consequence is assigned a 'case' (a child to be evaluated in the family setting). The Object, is the child to be assessed, the Motivation (stimulated by the law) the child's wellbeing; the Goal, to ensure the safety of the child. The action taken is the visit to the child's home, to observe the treatment of the child, to see the child washed or bathed (to observe any bruising, etc. ), to observe the relationship between child and parent(s), and, on the basis of this evaluation, to make a recommendation. The Mediating Artefacts, in the initial action, are the manual tools of note-taking - pencil and paper, and the abstract tools of the social worker's practical experience and theoretical knowledge of similar situations. The outcome of this initial action takes the form of feedback from the Subject to the Community (in the form of his/her supervisor(s)), on the basis of which further action may take place, that is, a new activity system is invoked. For example, a case conference (another abstract artefact) is called in which there may be representatives of the Social Services Department, the school or nursery attended by the child, the child's doctor, and, if the parents are 'known to the police', the relevant community officer (clearly an instance of the division of labour). 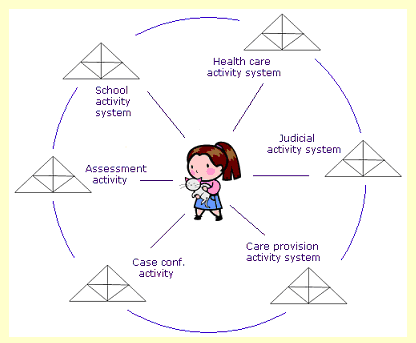 The outcome from that action may be a decision to take the child into care (invoking yet another activity system), placing him or her, initially, in a children's home before further assessment may lead to fostering (another activity system). A further outcome may be a court case of child abuse against the parent(s), which is yet another activity system. Our interest in information behaviour would lead us to explore the nature of the information available to the different parties in the different activity systems, the nature of the information created during the conduct of the activity (case records, case conference minutes, etc. ), the technical systems established to manage the various information resources, the flow of information from one activity system to another, the extent to which divergent interests of the different parties in the different activity systems might inhibit the exchange of information and so on. (We can represent the relationships diagrammatically as in Figure 4.) In the original investigation (Wilson & Streatfield 1980), very little of this was actually explored, but the adoption of an activity-theoretical frame work immediately directs one's attention to the wide range of contextual issues that influence information behaviour and information exchange. Here we see, in activity theory terms: the Motivation - an external request from a funding agency for a document on best practice in using colliery spoils; a statement of the Goal (to prepare the document), and the fact of the Division of labour in the overall project: 'Myself and a number of other colleagues…' Later in the interview the person concerned says: 'We have done various searches but we are not sure that we have covered all of the areas.' Again, the plural is used, indicating that the task of search was the subject of division of labour. 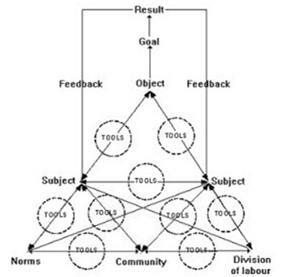 The detailed exploration of cases was not the purpose of that research project, but it is easy to see that an activity-theoretical framework would enable one to pursue individual cases over time to explore how the division of labour in information seeking (and information creation) was carried out, what informal norms the group evolved to divide the work and share their results, and the effectiveness of the division of labour. Leont'ev's definitions of these terms have clear application in information seeking research and, if applied rigorously, could help in the formulation of theory. Examining again the colliery spoils search, we can see that the motivation, the external request, stimulated the activity of document preparation, and that, to accomplish the goal of producing a 'best practice' document, it was necessary for the team to engage in information seeking actions. The conditions under which they worked enabled them to accomplish some of these actions themselves; thus, they were able to carry out the operations of search the Web of Knowledge databases, other databases accessible online, as well as the World Wide Web, and to search library resources, but the limitations in those conditions (no access to the commercial databases) induced them (or, rather, through the division of labour, one of them) to undertake the further action of seeking the project's assistance in carrying out a further search. The operations of that search were carried out, not by the individual himself, but by the search intermediary. We can note that the search intermediary was part of another activity system, that of the research project in which he was engaged, which had its own motivation and goals. This analysis of that particular case, brings out the rich contextual framework in which it was set and suggests lines of enquiry that a less-rich analysis would not suggest. In exploring the applicability of activity theory in this way, I became somewhat dissatisfied by the rather static character of the diagrammatic representations. Certainly, flows of information, action, influence, etc., are represented in the arrowed lines leading to and from the nodes, but the process is not altogether clear. Initially, I tried to resolve this by combining Bedny's and Engeström's diagrams in Figure 5. The use of the 'tools' circle may be thought excessive but, in fact, it serves the useful purpose of drawing attention to questions that one might wish to ask. For example, How are the norms that affect this activity transmitted within the community? What tools are used by subjects to communicate with one another their experience in the activity? How do the subjects organize the division of labour between themselves and to what extent is this affected by decisions of the community to which they belong and by the norms of behaviour as they affect this activity? This exploration of activity theory has served to show that it can be quite a powerful analytical tool and conceptual framework for enquiry. It should be noted, however, that, in spite of being termed activity theory, it is not a predictive theory, but rather a framework based upon a particular theory of human consciousness, aiming at explaining the character of human behaviour. The practical implication of this, in theoretical terms, is that no one theoretical position is involved in its use. Human information activity can be explored with the application of many theories, from risk avoidance to self-efficacy and more (Fisher et al. 2005) and there is no reason why a proponent of any theoretical position should not adopt an activity theory framework for his or her work. The same applies to method: both quantitative and qualitative methods can be applied and, indeed, for some work in information behaviour research, it may well be appropriate to use both: for example, carrying out relatively unstructured interviews and collecting computer log data for quantitative analysis. As to the value of activity theory for information behaviour research, it has already been noted that use of the framework can draw the researcher's attention to aspects of the context of activity that otherwise might be missed. 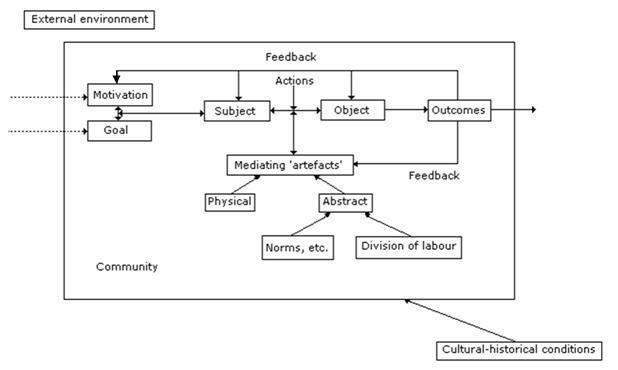 The comments above on the work of the AIMTech Research Group address this issue and we can summarise the point by noting that the cultural-historical setting of the activity and the relationship of the activity to the external environment constitute what might be called the 'macro-context' of the activity, while the goals and motivations of the originators of the activity, together with the artefacts, rules, norms and division of labour in the setting constitute the 'micro-context'. The extension of Engeström's concept of 'instrument' to include abstract and cultural 'tools' (although note that 'tools' were viewed as both material and abstract by Vygotsky and Leont'ev) also has implications for information research. Thus, in order to use a computer for information searching, the searcher must have a complex set of abstract concepts that constitute the 'tools' for searching: these concepts may be explicitly-learnt ideas, but they may also be the result of the 'sedimented' experience of using information search devices (from the card catalogue and the book index to the search engine), where learning has taken place through experience and without instruction. Exploring the possible research questions that arise out of this idea would fill another paper! 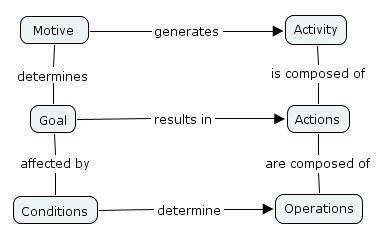 Finally, the distinction between activity, actions and operations is interesting and, at least to my knowledge, has been little explored in information science, if at all. It can be argued, for example, that information seeking is not an 'activity', but a set of 'actions' that support some higher level activity - examples of this have been given earlier. To treat information behaviour as somehow fundamental to human life may be as misleading as the early efforts to demonstrate a fundamental need for information. At the level of searching (an action? ), how do we distinguish between 'action' and 'operation'? For the skilled searcher the implementation of Boolean operators becomes an instinctive process, without much conscious decision making (an operation), whereas for the naïve searcher it may be considered an 'action' to be learnt and integrated into the emerging battery of actions that are used in the information seeking process: practice, familiarity and experience then reduce it to the level of an 'operation'. Again, the possible research questions are numerous: What is an information 'activity'? Considering 'information behaviour' as the totality of actions and operations employed by a person to discover, manipulate and use information, what different sets of actions and operations are employed by persons in different roles, or of different ages, or of different status in an organization, etc.? How does an action become an operation? This is particularly important when much information behaviour research involves small-scale studies of a very limited number of individuals: a re-orientation of research to larger-scale investigations with larger numbers of respondents and over a longer time-frame is becoming a matter of some urgency for the progress of understanding in the field. My thanks to Prof. Elena Macevičiūtė for helpful discussions on the original Russian sources, to colleagues in the AIMTech Research Group for their contributions to the debate and to the referees for their useful comments on the draft paper. Bedny, G.Z., Seglin, M.H., & Meister, D. (2000). Activity theory: history, research and application. Theoretical Issues in Ergonomic Science, 1(2), 168-206. Cole, M. (n.d.). A brief overview of Luria's life and work. In Marxists Internet Archive. Alexander Luria. Retrieved 20 November, 2005 from http://marxists.anu.edu.au/archive/luria/comments/bio.htm. Ditsa, G. (2003). Activity theory as a theoretical foundation for information systems research, In, G. Ditsa, (Ed.) Information management: support systems & multimedia technology. (pp. 192-231). Hershey, PA: Idea Group Publishing. Engeström, Y. (1994). Training for change: new approach to instruction and learning in working life. Geneva: International Labour Office. Engeström, Y. (1999). Activity theory and individual and social transformation. In Yrjö Engeström, Reijo Miettinen and Raija-Leena Punamäki, (Eds.). Perspectives on activity theory. (pp. 19-38). Cambridge: Cambridge University Press. Engeström, Y. (2000). Activity theory as a framework for analyzing and redesigning work. Ergonomics, 43(7), 960-974. Fisher, K.E., Erdeles, S. & McKechnie, L. (Eds.) (2005). Theories of information behavior. Medford, NJ: Information Today, Inc.
Häyrynen, Y-P. (1999). Collapse, creation and continuity in Europe: how do people change? In Yrjö Engeström, Reijo Miettinen and Raija-Leena Punamäki, (Eds.). Perspectives on activity theory. (pp. 115-132). Cambridge: Cambridge University Press. Hjørland, B. (1997). Information seeking and subject representation. An activity-theoretical approach to information science. Westport, CT; London: Greenwood Press. Hjørland, B. (2000). Information seeking behaviour: what should a general theory look like? The New Review of Information Behaviour Research, 1, 19-33. Hjørland, B. & Albrechtsen, H. (1999) Toward a new horizon in information science: domain-analysis. Journal of the American Society for Information Science, 46(6), 400-425. Kaptelinin, V. (1994). Activity theory, implications for human-computer interaction. In M.D. Brouwer-Janse and T.L. Harrington (Eds.). Human machine communication for educational systems design. (pp. 5-15). Berlin: Springer. Kaptelinin, V., Nardi, B. & Macaulay, C. (1999). Methods & tools: the activity checklist: a tool for representing the 'space' of context. interactions, 6(4), 27-39. Kuutti, K. (1991). Activity theory and its applications in information systems research and design, in H.-E. Nissen, H.K. Klein, and R. Hirschheim, (Eds.). Information systems research arena of the 90s. (pp. 529-550). Amsterdam: North-Holland. Mwanza, D. and Engeström, Y. (2005). Managing content in e-learning environments. British Journal of Educational Technology, 36(3), 453-463. Nardi, B. (Ed.) (1996a). Context and consciousness: activity theory and human-computer interaction. Cambridge, MA: MIT Press. Nardi, B.A. (1996b). Studying context: a comparison of activity theory, situated action models, and distributed cognition. In B.A. Nardi (Ed. ), Context and consciousness: activity theory and human-computer interaction. (pp. 69-102), Cambridge, MA: MIT Press. Rogoff, B. and Wertsch, J. (Eds.) (1984). Children's learning in the 'Zone of Proximal Development'. San Francisco: Jossey-Bass Inc.
Rubinshtein, S.L. (1957). Existence and consciousness. Moscow: Academy of Pedagogical Science. Spasser, M.A. (1999). Informing information science: the case for activity theory. Journal of the American Society for Information Science, 50(12), 1136-1138. Wilson, T.D. (2004). Talking about the problem: a content analysis of pre-search interviews. Information Research, 10(1), paper 206. Retrieved 31 December, 2005 from http://informationr.net/ir/10-1/paper206.html. Note: I have prepared a Webpage of links to information and sites on activity theory, which I shall update regularly. If anyone finds sites of interest and importance, please let me know.